Complementary pet food for adult cats. FELIX MINI FILETTI also have Vitamins, Taurine and no added artificial colorants. So go ahead and enjoy FELIX MINI-FILETTI! Meaty treats with salmon. MINI-FILETTI / Purina MINI-FILETTI are carefully prepared tasty chicken treats mixed with Salmon snacks for that extra flavourful bite. A yummy complementary pet food your cat will love morning, noon and night! Made with 90% meat and animal derivatives and fish and fish derivatives, these meaty treats will delight the carnivore in your cat! 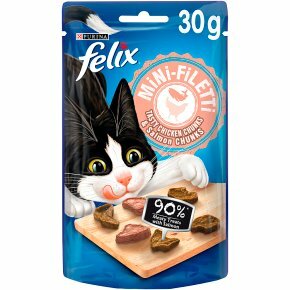 Purina FELIX MINI-FILETTI are carefully prepared tasty chicken treats mixed with Salmon snacks for that extra flavourful bite. Made with 90% meat and animal derivatives and fish and fish derivatives, these meaty treats will delight the carnivore in your cat! FELIX MINI-FILETTI also have Vitamins, Taurine and no added artificial colorants. So go ahead and enjoy Purina FELIX MINI-FILETTI! Purina FELIX MINI-FILETTI is available in a wider range of variants for your cat. So try and enjoy these exciting varieties today! Daily Feeding amount for a 4kg cat is approx. 8 pieces. Clean fresh drinking water should be always available. Supervise your cat when giving him/her the treats. Follow the Feeding Guidelines for your cat's health.